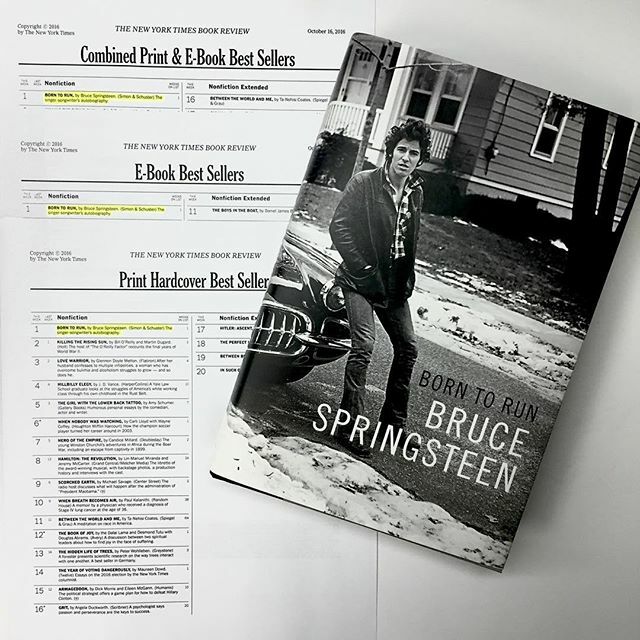 Bruce Springsteen’s 'Born to Run' autobiography was the top-selling book in multiple countries last week, earning raves from fans and critics worldwide. ‘Chapter and Verse,’ the audio companion to the gripping 528-page memoir, is 2016’s highest-debuting artist compilation, entering the Billboard 200 albums chart this week at No. 5. 'Born to Run' topped the New York Times Best Sellers list in the US and also debuted at No. 1 in the UK/Ireland, Germany, Denmark, and Sweden. ‘Chapter and Verse’ bowed in the Top 10 in 16 countries besides the US, with No. 2 debuts in the UK, Ireland, Australia, Sweden, Austria, and Italy. The album's No. 3 debut in Portugal gave Springsteen his highest chart entry there in more than a decade. Springsteen’s public appearances to support 'Born To Run' have been epic and emotional, with than 2,000 fans packing the Barnes & Noble near Highway 9 in Freehold, NJ, on the book’s release day, September 27. After greeting more than 1,000 fans at NY’s Union Square Barnes & Noble, Springsteen was interviewed by Apple's Senior VP of Internet Software and Services Eddy Cue for a SoHo Apple Store event that streamed live on Facebook. Tickets for Springsteen’s meet-and-greet at the Philadelphia Free Library sold out in nine minutes. In Los Angeles, fans began lining up outside The Grove shopping center three days early. Ticket demand for his appearance at Powell’s Books in Portland, Ore., crashed the store’s website. Springsteen will appear in conversation with New Yorker editor David Remnick at The New Yorker Festival this Friday, October 7, and wraps his U.S. series of appearances with a stop at The Harvard Coop in Boston on Monday, October 10.